SurfGuitar101.com | News: Stories with tag: "phantom-operators"
Phantom Operators release soundtrack to "Mortis" podcast! The Phantom Operators in conjunction with Mortis Media, producers of the "Mortis" podcast have released a soundtrack album of all the songs used in the podcast. The "Mortis" podcast is unique in the fact that all the songs are exclusively produced for the podcast and cannot be heard elsewhere or on any other of the band's releases. The twelve song album made its debut this past weekend at the Marble City Comic-Con in The band's hometown of Knoxville, Tennessee and is now available digitally at the Mortis Media bandcamp page, MortisMedia.bandcamp.com. The band expects to put out more releases through Mortis Media in the near future so stay tuned! Phantom Operators release new album! 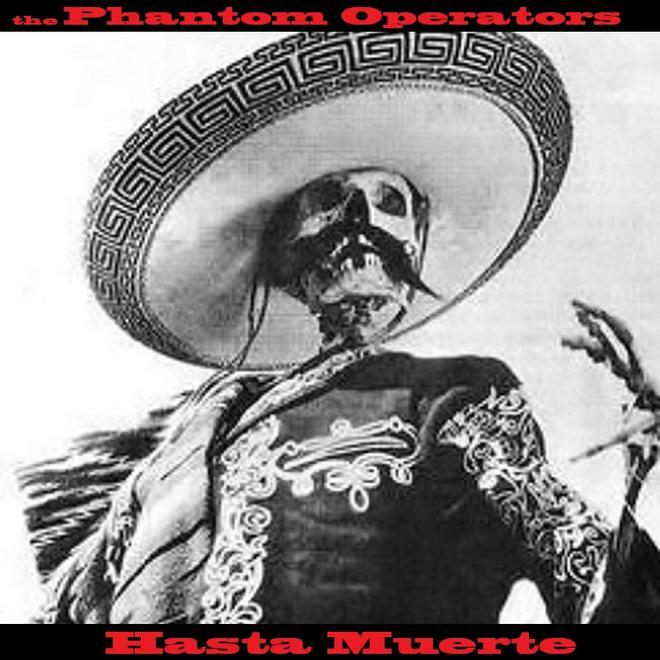 The new full-length album from the Phantom Operators, "Hasta Muerte" is available now at PhantomOperators.Bandcamp.com. The album features ten all-new tracks that continue to push the boundaries of surf and instrumental music in the Phantoms' own unique way. This is the 2nd full-length release from the band, after last year's "Metal Mariachi Music". For more info, follow the band on twitter @Phantoms_76 or e-mail PhantomOperators@outlook.com. New Phantom Operators Album out soon! The Phantom Operators' new full-length album "Hasta Muerte" will be out by the end of the month of February! The album features ten new tracks in the Operators' unique style. It will be available for download from their site at PhantomOperators.Bandcamp.com. For more information and updates, you can follow the band on Twitter @Phantoms_76 or go to Reverbnation.com/PhantomOperators. Phantom Operators "Lords of the Desert" now available! The Phantom Operators have released two new songs, "Lords of the Desert" and "Death Rides a Horse", which are available at their bandcamp site, PhantomOperators.Bandcamp.com. They also have an exclusive song "Ghosts in the Canyon" which can be heard only on the horror/sci-fi podcast "Mortis Radio" (facebook.com/mortismedia), Expect a full length release by the end of 2015! Phantom Operators release "Surf Trippin" for V2 Tuesday! Phantom Operators announce "V2 Tuesday"! On Tuesday March 10th, the Phantom Operators will launch "V2 Tuesday", in which they will donate 100 percent of their LP sales on PhantomOperators.bandcamp.com towards the V2 indiegogo campaign. You can follow on social media thru the hashtags #vivav2 and #V2Tuesday! New Phantom Operators songs this spring! The Phantom Operators will be releasing some all new material this spring in conjunction with a new podcast called "Mortis". "Mortis" will center on "All things left of center". The Operators are contributing theme and incidental music that will be used on this podcast. The soundtrack will be released some time in April and will only be available to listeners of the podcast and followers on social media. (Facebook, Twitter, and their own site Mortis.TV). These songs will have a little darker edge than the tunes on their debut LP, "Metal Mariachi Music" (Think Joy Divivsion covered by the Ventures!) The Operators are excited to be a part of this podcast and have really enjoyed making music for it. For more info, You can go to Facebook.com.MortisMedia or follow on Twitter @mortistweets.